The pace of jobs creation has certainly improved in 2018, averaging 207,000 per month versus the 182,000 per month average for 2017. Growth is strong, business confidence is high and corporate balance sheets are in great shape thanks to healthy profit growth and tax cuts. As such, businesses are looking to expand and hire new workers. On this front, the September ISM manufacturing survey saw the employment component hit a seven-month high while the National Federation of Independent Businesses reported that a net 26% of small firms are looking to hire more workers. However, we think there is the likelihood of a softer figure for September. This relates to Hurricane Florence, which caused significant damage as it made landfall in Virginia and the Carolinas. Gauging the likely impact on the jobs market is tricky, but it is likely to be significantly less than the temporary distortion caused by Hurricanes Harvey and Irma last year. Back then 2 million jobs were estimated to be based in the flood zone in the Southern US versus a more modest 682,000 in the area impacted by Florence. 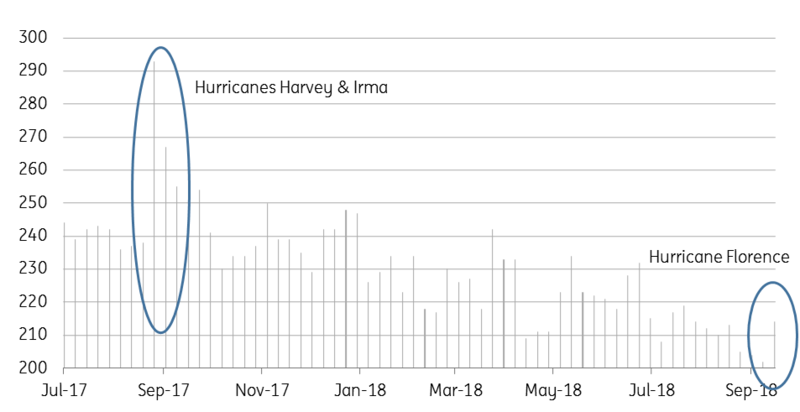 Moreover, the initial jobless claims data suggests a far more muted impact given there wasn’t a spike following Florence, versus a sharp jump when Harvey and Irma struck last year. Last September payrolls rose only 15,000 on the back of the hurricane drag before rebounding 277,000 in October. This time we look for a far more modest impact on payrolls. We predict a respectable rise of 160,000 versus the consensus forecast of 180,000. The range of forecasts is very wide because of this uncertainty – a low of 125,000 versus a high of 220,000 according to Bloomberg’s survey of economists. October should see a stronger figure as workers are required for the clean-up operation while rebuilding and replacement spending will mean more job creation. Last month offered some real encouragement on pay with a 0.4% MoM gain leading to the annual rate of pay growth hitting 2.9% - the fastest rate since April 2009! What made it especially impressive was the working day effects should have been a huge headwind. There were 23 working days in August, but only 21 in July so if you are on a fixed salary this means that your daily and hourly pay rate should effectively be lower in August than in July. Given this, getting such vigorous growth was impressive. This month the working day effect should reverse in September (only 19 working days) so we are hopeful of another decent MoM rate of pay growth – we look for 0.3%. Unfortunately, the annual rate of pay growth is likely to slip back temporarily to 2.8%, but should finally break above 3% YoY in October. The household survey used to generate the unemployment rate tends to be choppier than the payrolls survey of employers, but the theme remains consistent of ongoing healthy job growth. Due to statistical effects we look for it to drop to 3.8%, which would match the recent multi-year low in May. We have to go all the way back to the late 1960s when we saw the unemployment rate below 3.8% with any consistency. The economy is on course for 3% growth and inflation pressures are on the rise. While the Fed has dropped the term “accommodative”, monetary policy can hardly be described as restrictive and as such, we look for a December rate rise while the Fed’s assessment that three rate hikes are likely next year seems sensible.